quality and convenient placement in almost any location. Keyhole openings in the back allow these speakers to be neatly mounted on a wall. Compatible with HD audio sources, the NS-P20 delivers superb music and movie sound. 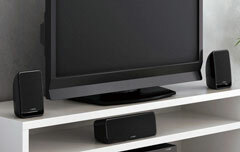 The speakers are tuned to deliver a clear, soft sound that is pleasant to listen to for long periods. These suitably sized speakers deliver a fullbodied, well-balanced sound. Affordable yet high quality, the NS-P20 is an excellent choice for setting up a home theater. Yamaha’s exclusive Advanced Active Servo Technology (Advanced YST) generates incredible bass from small speaker enclosures. 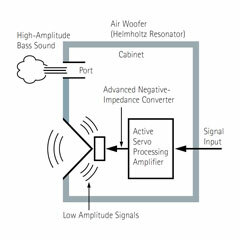 Advanced YST is the ideal method of combining amplifiers and speakers for maximum performance. This system’s advanced negative impedance converter intelligently adjust the negative impedance generation as the speaker moves, creating a hard, rigid cone that prevents deep resonant waves from leaking out of the speaker cone. This means the full power of the waves is forced out through the air port, resulting in clear, powerful bass. Advanced YST produces rich bass sound, and the addition of a Linear Port reduces extraneous noise for even higher quality.